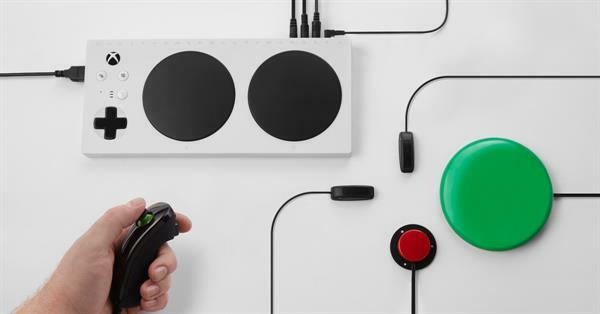 Microsoft has announced the Xbox Adaptive Controller, an Xbox controller designed for people with disabilities. Microsoft has announced the Xbox Adaptive Controller, an Xbox controller designed for people with disabilities. It has two large programmable buttons and 19 jacks that can be connected to a range of joysticks, buttons, and switches to make it easier for a wider range of people to play games on Xbox One and Windows 10 PCs. The focus is on connectivity and customizability, with players able to built a setup that works for their capabilities and needs. It won’t be an all-in-one solution for many games, but through the use of peripherals and the Xbox's system-level button remapping, the possibilities could be endless. The Xbox Adaptive Controller will cost $99.99 and goes on sale later this year.